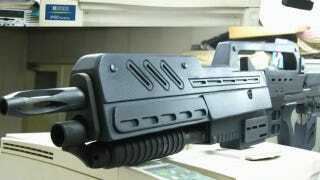 One intrepid Japanese model maker recreated the Morita Assault Rifle from Starship Troopers as a full-scale replica. Bless him. Toys guns were sawed into pieces and then connected to an aluminum frame. Other parts were crafted, and the gun was then finished to give it a nice sheen. The result is magnificent—even more so when posing next to a Bug while decked out in Mobile Infantry battle gear.